This guest post is brought to you by Janet. Here’s the dish on your DISH: It’s an accessory. It is now an accessory that can be customized to compliment the rest of your abode. 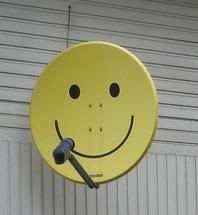 If you have DISH Network, but don’t want to settle with DISH that looks like the rest of the neighbors. 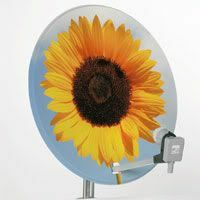 A new service is here to help you: it’s called SatelliteDishSticker and it’s just that – a sticker for your DISH. You can show national pride or show how much you love kittens. If you need more ideas, here you go. 2. If you’re an artist, times are probably tough right now. Here is a niche you could explore. Just follow the DISH salesperson through the neighborhood and offer to spruce things up a bit for new customers. 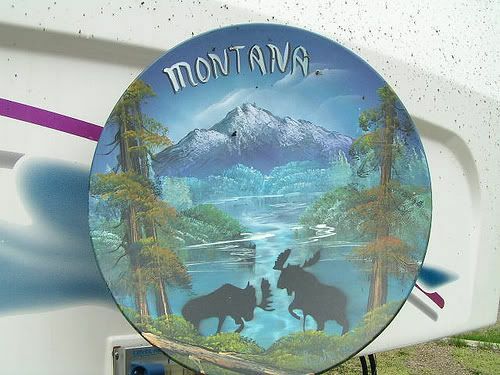 If you get one of these stickers or have photos of unique DISHes, please send us a picture. It just goes to show you that people don't like a blank space. Given them a surface, and they will decorate. Great guest post. The smiley face DISH seems a little unoriginal to me. I love the sunflower one. Interestin article. I hope you don';t mind me tranlating this to bulgarian in my blog? This is something innovative and interesting..Cheers!